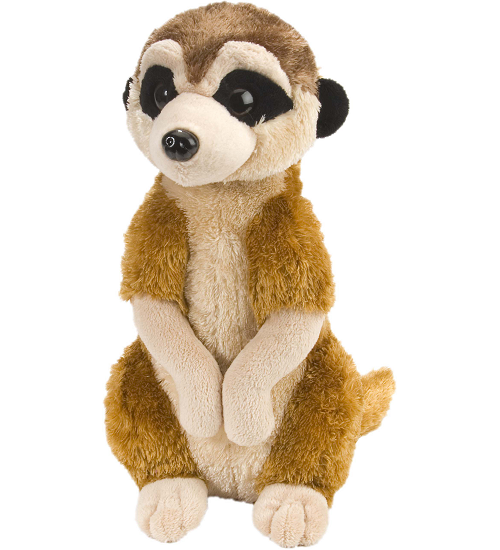 This huggable plush meerkat from Wild Republic's Cuddlekins collection has a wonderfully cuddly body with soft light brown fur, tan tummy, feet, arms, and face, dark brown head, and black ears and eye patches. This meerkat stuffed animal will prove to be a lifelong friend and you stare into his warm brown eyes and feel your heart melt. A portion of the proceeds from the sale of this adorable Cuddlekins stuffed meerkat helps to provide housing and education for disadvantaged children, as well as protection for abandoned animals throughout the world. Fun Facts about Meerkats: Did you know that meerkats are such good hunters that sometimes they are domesticated and help control rodent populations?